Cocktail parties have been a popular social gathering for years. They were a hit during the first few decades of the 1900's, were fueled by Prohibition, and died off a little during the last part of the century, but they're back. Cocktail parties are great for entertaining friends or business associates, or a combination of the two. They're also great for open houses or receptions, both business and personal. The average cocktail party lasts 2 to 3 hours during which guests snack on a simple spread of food and imbibe on great cocktails while chatting with other guests. It's actually quite an easy event to plan and there are so many options available. Is this a casual event for friends or a formal business networking event? How much time and effort do I want to put into it? Will there be a full bar or a limited cocktail menu? Will the party be indoor or outdoor? If outdoor, do I have a plan for inclimate weather? Should guests be asked to bring anything? A full course meal is not necessary for a cocktail party. Simple foods, such as hors d'oeuvres and other finger foods, allow guests to graze throughout the event as they feel the need. Some tried-and-true cocktail party foods such as bruschetta and tapenade and crackers are perfect for almost any taste. Even something as simple as a cheese, crackers and cut fruit platter is perfect for the casual party. To be a good host you should have some kind of food available and if you don't want to deal with food at all, call a caterer. Obviously, the drinks are the most important part of a cocktail party and there are two options. Full Bar: If you opt for this you give guests the option to choose their favorite drink. This is great if you have a well-stocked bar or if you're willing to buy the essential spirits and are able to mix up a variety of drinks (or have a good bartending guide). Drink Menu: This encourages people to step out of their drinking routine. You’ll also save money because you don’t need a fully stocked bar. Make up a list of the drinks (including ingredients) and set it on the bar for guests to peruse. 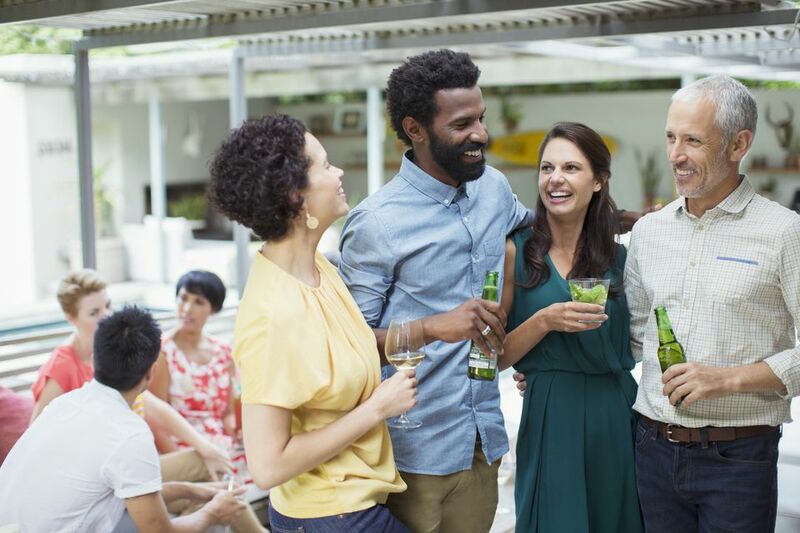 Only the ultimate host or hostess can do everything on their own and still be available to socialize with guests. The rest of us need some help. Ask friends or family if they'd be willing to handle the food or bartend for the event and if that doesn't work hire out the work. Many catering companies also provide bartending services so this is logical if you're already calling the caterer or you could ask an aspiring or young bartender if they'd like the experience. It's always nice to offer your bartender (pro or amateur) a tip jar for guests to contribute to. Make sure you have all of the essential bar tools. Send invitations early, but not too early, 2 to 3 weeks should be sufficient unless it's a busy time of year like November and December. Have plenty of cocktail napkins, plates and glasses available. Plan on 50-75% of invited guests to attend to estimate the number of drinks you'll be pouring and how many bottles you'll need. Estimate 2 to 3 drinks per person. Add a "WOW" factor. This could be a drink, garnish, food dish, activity, display or whatever fits your party. Every good host or hostess is responsible for those drinking at their party. Be aware of guests who have had too much to drink, cut them off when necessary and arrange for designated drivers. Also, have a few non-alcoholic drink, or mocktails, available for non-drinking guests.